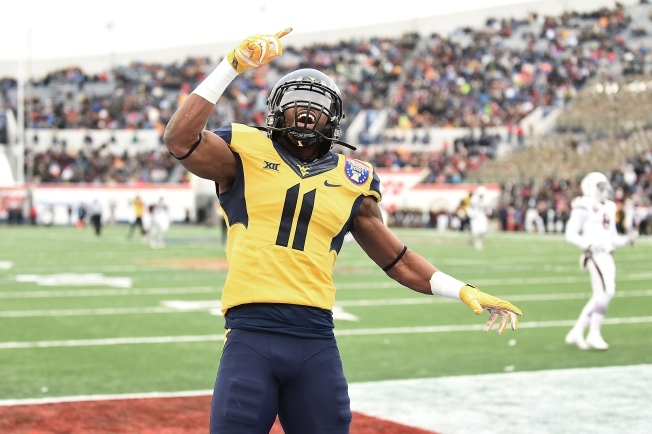 Kevin White #11 of the West Virginia Mountaineers reacts to a touchdown against the Texas A&M Aggies during the second quarterof the 56th annual Autozone Liberty Bowl at Liberty Bowl Memorial Stadium on December 29, 2014 in Memphis, Tennessee. The Chicago Bears are in need of upgrades at several positions on the field, and wide receiver is one area they could improve in at this month’s NFL Draft. One player that they could be looking at with the seventh overall pick is West Virginia wide receiver Kevin White. The receiver said in an interview on Thursday that he is scheduled to visit the Bears before the draft takes place, and that he’s also going to meet with the New York Jets, the New York Giants, and the St. Louis Rams. He has already visited with the Tennessee Titans, who hold the number two pick in the draft. White had an outstanding season with the Mountaineers, hauling in 109 receptions for 1447 yards and 10 touchdowns with the team in 2014. He certainly has the skillset the Bears will need to replace Brandon Marshall, but the only question is whether or not the Bears will feel comfortable taking a receiver with only one really good year at the college level with the seventh pick. White also confirmed that he will be in Chicago for the draft, which kicks off on April 30. Florida State QB Jameis Winston and Oregon QB Marcus Mariota will reportedly not be present for the event.